Moon Phase: New Moon on following Thursday. Set Up: 7'0" 3wt Cane rod made by moi. (Disaster Creek taper), 855 Quad made by Erik et Moi. 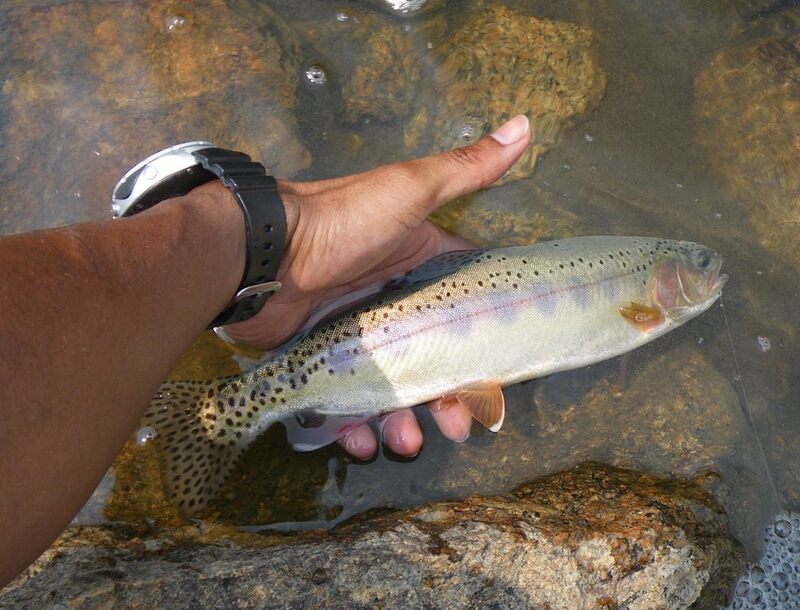 The long Labor Day weekend was fit only for the rarest of Sierra trout…the Golden Trout….er….Brook Trout…. and the Paiute Trout! It all started early Saturday morning as I pulled out of my driveway, heading to the Eastern Sierra. The morning was full of signs. I passed a lone runner at 4am just down the street from my house. A reminder that I was going to miss my long run on Sunday morning and every Sunday this month due to IT Band syndrome. Something I hoped wouldn’t affect my hiking this weekend. A fire truck crossed my path just before the freeway entrance. Another reminder of sorts, I’d have to travel over Sonora Pass due to the Rim Fire blazing outside of Yosemite. The Rim Fire started 3 weeks ago and has burned more than a quarter of a million acres, the third largest forest fire in California history and the largest recorded in the Sierra Nevada. It was started by a hunter's errant camp fire and it’s affects are being felt far and wide. It’s amazing to me how many people will walk away from a fire when it’s still hot and think its out. Take a hint from the Boy Scouts folks, if you hold your hand over the extinguished coals and feel warmth, then your fire’s not out. Simple as that. I pulled into Bridgeport around 8:30 am thinking, “there’s no way we’re going to backpack in this”. Smoke from the Rim Fire had filled the Bridgeport Valley, reducing visibility to less than one quarter of a mile. It was thick and foul. 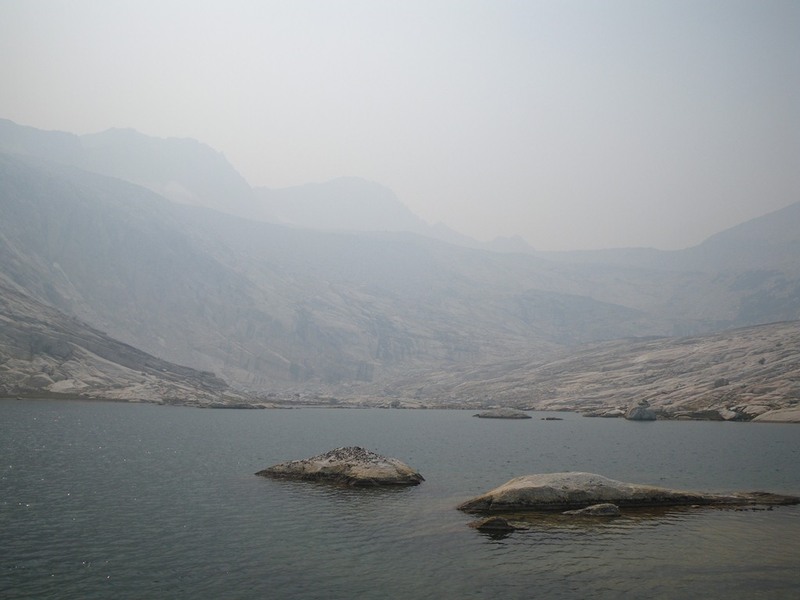 Fortunately, smoke in the Mono Basin was lighter and lighter still at Saddlebag Lake, where our long weekend adventures would begin. Fishing buddy extraordinaire Roger was waiting for me at Saddlebag Resort. Traffic made me late and I’d already told Roger to head on without me. I’d meet him at our first destination for this weekend, Conness Lake #3. Per my usual Conness routine, I settled in for breakfast at the resort before beginning the hike to the lake. When I got to the lake, Roger was exploring the area between lakes 3 and 4. Walkie Talkies allowed us limited communication, limited because Rogers radios were slightly different than mine and it turned out that from the time I finished my breakfast until the time I met with Roger on lake 3, I was sending nothing but static. I joined Roger and then headed to a portion of the lake that had been good during my previous visit. The fish were ready but I wasn’t. There weren’t visibly active fish so while prospected with my nymph, I kept scanning the water looking for fish. I got plenty of strikes but they all tended to be when I wasn’t paying attention to my line. Untangling the twist knot in my flyline after the cast? Check- Fish On! Checking the water on the bank to my left? Check- Fish On! Looking over to say something to Roger? Check – Fish On! Like clockwork, all morning, a moment’s inattention and it was- fish on! I took it all in stride. The most exciting take of inattention came when I was pulling my line in for a roll cast. I lifted the rod tip up, the flyline slide toward me and for some reason that I don’t recall, I paused mid-cast. Just then a colorful Golden shot out of the dark depths and crushed my fly. I tried to recover by initiating a half roll and pulling in all the slack but by then it was too lake. A small splash at the surface and the fish was gone…. It’s not that I didn’t land any fish; I finally managed to land and photograph a “silver phase” Golden at lake 3 but somehow, the fish I missed to foolishness stand out more. Later in the afternoon, Roger had his own trials with a nice fish that he spooked and was waiting to return. Meanwhile, I decided to head down to lake 1. The fish at lake 1 were a bit more predictable and I was a bit more attentive. Strikes came thick and fast. "What are those little hamster things called?" "Yeah, I saw a couple of those yesterday......"
That night we drove down to the Devil’s Postpile National Monument. Part II of our Labor Day Weekend adventure would start there. 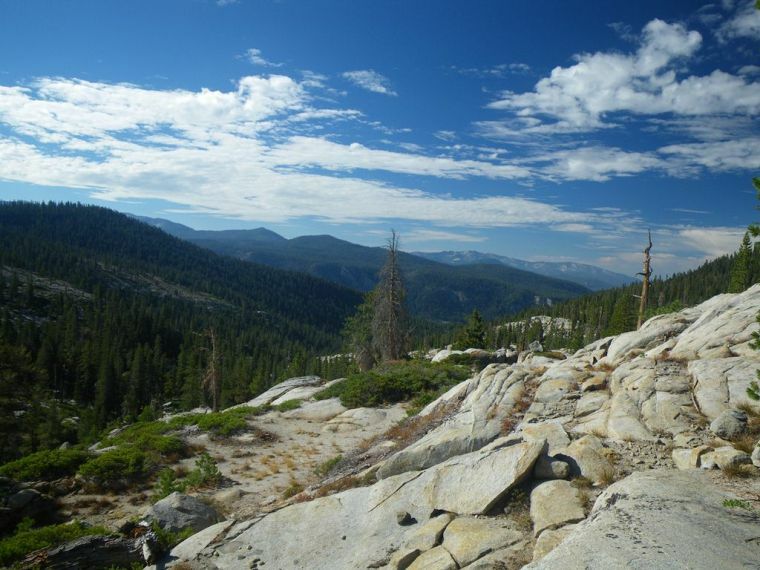 Friday and Saturday permits for the Fern Lake trail were full, forcing our backcountry trek to begin Sunday morning. Not a problem really, since we both decided on a 4 day weekend, but it did mean that our destination lake, Fern Lake, would be potentially crowded. Fortunately that was not the case. In the last 30 minutes of our hike we were passed by a fast moving young man and women also headed to Fern Lake. They would be our only company for our 3 day journey. It was an up and down, sandy, smoky trek to Fern Lake. We took our time searching for and setting up camp and finally hit the water in late afternoon. The water was dark with lots of cover. The outlet was choked with fallen timber, reminding me of a certain Brook Trout lake I know; I fished it like said Brook Trout lake and voila, we turned up 6 inch Brook Trout. 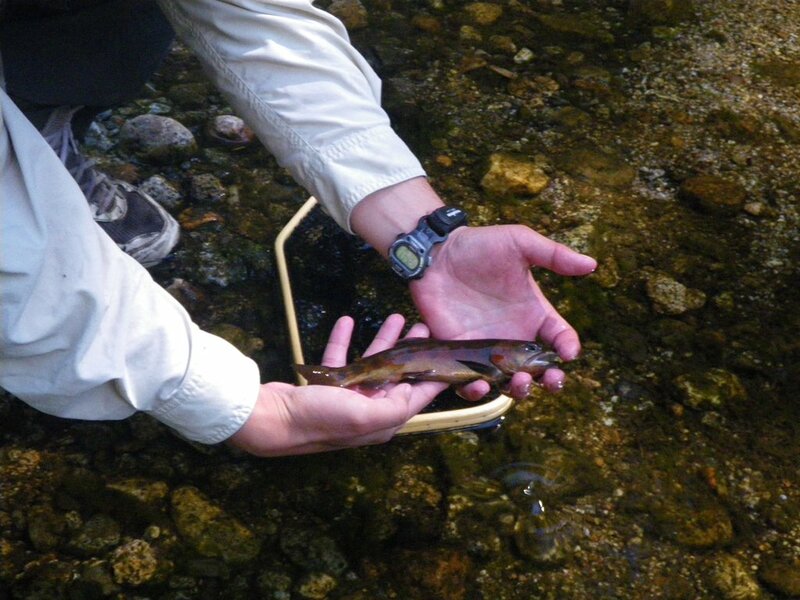 We moved along the shoreline using a strip, strip, pause routine and…… turned up more 6 inch Brook Trout. The fish were incredibly consistent, all almost exactly the same size but none had that stunted, snaky look that overcrowded, underfed, Brook Trout seem to have. The steady stream of dragon fly nymphs along the bank must have seen to that. That night the wind rippled through my tent and kept me up but it also cleared out a lot of smoke and Monday morning the smoke seemed a thing of the past. There’s something unnatural about waking up in the middle of backpacking trip, knowing that, that day was going to be your toughest hiking day. Logic usually dictates that the toughest days come at the beginning of the trip when you’re fresh or at the end of the trip when you’ve got a lighter pack. Not smack dab in the middle, when you want to rest. But that’s the way we planned it. Instead of a 17 miles, one day trip into this area as I had done last year, we decided on a 3 day trip of 6 miles the first day, roughly 8 miles the second and 6 miles the last day. Monday was the big day. We were off to search for my net. There was plenty of bear sign on our hike to one of the few creeks outside of Silver King Creek to hold a population of Paiute Cutthroat Trout. Brushy and trail less, I lost a beautiful Amboyna fishing net here about this time last year. I was back to help Roger catch a Paiute but in the back of my mind I was hoping that somehow we’d stumble on my net simply hanging there, waiting for me to find it. Of course that didn’t happen and given the amount of snow, run off and brush, I’m sure my net is buried in a snaggle of trees somewhere. Last year I failed to hike down to the below the confluence of several forks of the stream where I thought the water and fish would be bigger. This year we made it past the confluence but found that the flatter terrain slowed the water. There might be even better water continuing downstream but what we found is that as the stream left the steep portion of the canyon, the brush around and above the stream became worse and the size of the stream did not change significantly. At times it was impossible to simply walk up the stream because of the density and height of the brush. The steeper portions of the canyon created deeper pockets and better holding water. We found a pretty good spot to start. A wide bend in the creek that was fairly open. Roger made the first cast and was pretty quickly into his first fish. The stream was too brushy to properly leap frog our way up the creek; it would take too long bushwhacking out and back to the stream, so we made our way upstream together- taking turns fishing each run. I won’t say the fishing was easy but it was somewhat consistent. Our flies were quickly accepted in some runs while being completely ignored in others. Some fish would take the fly once and if we’d missed the hook up, we’d be forced to changed flies, while others we could present to time and time again until we actually landed the fish. One fish in particular stands out to me. It wasn’t the largest fish I would cast to but it was a bit finicky. It was late in the day and we’d just starting getting into the pocket water higher in the canyon. I was fishing a decent sized pocket that was easily a few feet deep. Earlier in the day I had switched from a cripple caddis to a black ant as it seemed to draw more aggressive, consistent strikes. I made my first cast and the fish rose, followed the fly for a while and then turned away as it entered the tailout. A few more casts were met with the same response. With each cast I put the fly higher in the pool until the fly was landing below, or bouncing off the rocks beside, the plunge. After about 4 casts the fish finally took the fly. The hook set wasn’t solid and it momentarily put the fish down. A little patience and a fly switch and I was back in business. The fish wasn’t as interested in cripple caddis as it was the ant but it did show some interest and on two occasions it rushed to take the fly opened its mouth and turned away. Almost like a child smelling its food before taking the first bite. It took a lot of patience not to strike prematurely but I didn’t, knowing the sudden disturbance would likely put the fish down, perhaps for good. Enter the third fly, a black soft hackle beadhead fly. By this point the fish had hunkered down a bit deeper in the pool and become a bit harder for me to see. Its hackles were up, so to speak. I made several blind casts with the nymph before Roger was able to confirm the location of the fish dead center in the pool. I made a cast directly below the plunge which theoretically should have fallen right in front of the fish. No joy. I was close to calling it a day when I decided to make a deeper cast to a pocket of slow water to the left of the plunge. The fly tucked in deep, with little splash and that sixth nymphing sense kicked. I didn’t consciously register a take, I just knew I had it and set the hook. That was my last fish of the day. Roger continued to fish a bit longer, truth be told we had just gotten into what, after two visits, I consider to be the “good” water, when we had to leave. We were shooting to be back at the camp by 5:30. The climb out of the valley was uneventful. I learned from my last visit and set up several trail ducks which sped our accent to the formal trail, those ducks are still standing. That night we were treated to a clear starry sky mid-evening with light showers just before morning. In the morning we hiked out. I considered for a moment taking a short hike to catch some Lahontans, with a quick visit to Hot Creek to finish out the ultimate Sierra Grand Slam but a little weather started to come in so I pointed my car north on HWY 395 and headed home.